See Special Session for a more detailed description. Whether you're new to the field, want to brush up on the latest information and resources or just ask a few questions, this session is for you. Dr. Smith will start with a review of basic concepts for literacy and health literacy as they relate to health and healthcare including suggestions for learning more about health literacy and review a variety of easily available useful resources. With plenty of time for questions, this session is a great way to kick off the conference. During this interactive workshop, participants will walk through the process of incorporating health literacy best practices into program design. The CARE program will be used as a model to describe how our team implemented a communitywide promotora program that uses best practices such as a communitywide needs assessment and incorporating teach-back into curriculum design. Participants who attend this session will hear how a promotora engages the senior population and will walk away with practical tips that can be implemented into their current programs. This presentation explores how to best empower non-native English speakers (NNES) by building rapport, awareness of communication strategies, and comprehension checks. Through engaging activities, participants will gain a broader and deeper understanding of the NNES experience in a health care setting, while raising awareness of their perspectives. Participants will hear firsthand accounts (via video) from local NNES regarding their challenges in healthcare settings. These testimonials will describe ways NNES are building communication skills to better navigate the US system of healthcare, as well as give advice to medical professionals on how practitioners can help bridge the communication gap. Participants will add to their "toolkit of strategies" to enhance their interactions with NNES as they journey together on the road toward complete health literacy. This interactive session, structured on Building Health Literate Organizations: A Guidebook to Achieving Organizational Change, will address key health literacy development areas that intersect with the attributes of health literate healthcare organizations: engaging leadership; preparing the workforce; the care environment; involving populations served; verbal communication; and reader-friendly materials. Working together we will address three questions: Why do you need to address health literacy issues in this area—why is it important? What would success in this area look like—what are the target outcomes? How—what tools, resources, and actions will you use to reach those target outcomes? Participants will gain a working knowledge of the Guidebook, and create a plan to advance the health literate attributes of their healthcare organization, to lead it to: be easier for people to use; deliver patient-centered care; and support patient-provider communication to improve health care quality, reduce errors, enhance health equity, facilitate shared decision-making, and improve health outcomes. The purpose of this session is to provide an overview of Health Care Improvement Foundation’s peer educator program, and to support participants in developing their own program plans. The session will begin with a description of the program, including successes, challenges, and lessons learned over the last six years. Then session participants will be given tools to assess the feasibility of implementing a peer educator program in their organization. Participants will work through a list of considerations (e.g., target audience, subject matter, potential partners, funding). Finally, participants will develop an action plan as a step towards creating their own peer education program. This workshop will expose attendees to a unique partnership to incorporate health into adult basic education and English language learner programs. It will illustrate how a recent health literacy summer program for refugees and other language learners from 27 countries arose out of earlier partnerships. Lessons learned about barriers and facilitators to partnerships and programming will be examined. We will also look at how to plan based on student needs. Participants will have the opportunity to identify partnerships they might build in their local areas. Workshop participants will leave the workshop with tools for building partnerships and meeting adult learner needs in the programming. This will include meeting adult learner needs through curriculum selection, removing barriers that can interfere with learning, and leveraging financial support. Helen and Mitch will talk about everyday communication in situations that relate to health, such as when interacting with citizens who have hearing loss or learning challenges. They also will discuss communication during an accident, fire, active shooter event, or other crisis. Helen and Mitch will then encourage a group conversation and exchange of ideas about using communication to build trust. This can be trust between individuals, across professions, and within communities. Regardless of where we work and what we do, all of us share a commitment to communicating in ways others can understand. Please join this conversation about health communication through the lens of health literacy and law enforcement. Moderated by Michele Erikson, Executive Director, Wisconsin Literacy, Inc. Listen to inspiring examples of improving healthcare engagement from 2 representatives from the African-American and Transgender communities. Aaron Perry of Rebalanced Life and Wellness, and Ginger Baier from Outreach in Dane County, WI will share their own stories of both challenges and innovative solutions for positive engagement with the healthcare system from their community and in partnership with providers. Come hear their experiences and recommendations for improving health and healthcare communications. The Institute of Medicine identified that "Health literacy is an interaction between the skills of individuals and the demands of the health system'. (Prescription to end Confusion, 2004). In New Zealand the Framework for Health Literacy specifies that the health system and healthcare organisations need to reduce health literacy demands. In New Zealand we have developed two methods for identifying health literacy demands and an additional process for identifying the specific literacy and numeracy knowledge and skills required to meet the health literacy demands. This workshop will include hands on practice for participants to inform a programme of building health literacy to meet demands. This session describes a study that examined whether a patient-centered intervention that addresses health literacy AND focuses on modifiable psychosocial factors (self-efficacy, illness beliefs, and medication beliefs) would improve medication adherence among patients with diabetes. During the preparatory phase of the study, the team developed several health literate handouts for the patients. Prior to initiating the intervention, researchers administered the Newest Vital Sign tool to assess the participant’s health literacy level. Those results were shared with the clinical pharmacist to encourage tailored discussions aimed to improve patient understanding. 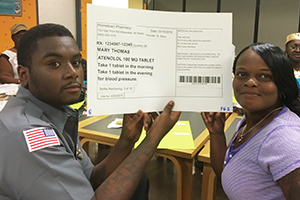 In addition, education handouts were used to reinforce the pharmacists’ messages to their patients. This session will explore how the study team developed these materials and share any preliminary results of the study that are available. This session will discuss the ways in which professionals in adult literacy and public health can work together to make a difference. This session will offer guidance on how public health agencies are organized on the state, county and local levels so that literacy professionals will know how they can identify and contact public health programs of interest. In addition, the speakers will provide examples of public health programs that are especially designed to serve people with low literacy. They will also offer suggestions on how literacy programs can assist public health departments in achieving their goals of serving at-risk populations and provide an opportunity for members of the audience to share their experiences in cross-collaborating between public health and adult literacy. This workshop will provide an overview of the Northstar Digital Literacy Project, which includes a series of online, self-guided modules to assess the ability of adults to perform basic skills needed to use a computer and the internet in daily life, employment, and higher education. Modules include basic computer skills, internet, and information literacy. Participants will learn how these assessment modules, and related curricula resources, can be used to help build individual and community capacity to improve health outcomes. The session will conclude with a participatory discussion of key skills which may be included in a proposed Northstar module directly focused on increasing digital literacy in a healthcare context. This session will focus on health literacy successes, challenges and lessons learned of the Florida Health Literacy Initiative, an award-winning program that has served almost 18,000 students in partnership with dozens of local adult education providers throughout the Sunshine State. The Initiative’s goal is to combine English for Speakers of Other Languages (ESOL) and literacy instruction with contextualized health-education to help students make informed choices about their health and nutrition. This session will include: 1) a brief introduction to the freely available Staying Healthy curriculum, consisting of five evidence-based publications focused on providing a plain language approach to health education; 2) a review of the Initiative’s multi-year grant program, sponsored by the Florida Blue Foundation, and the broad range of state and community partnerships which have resulted; and 3) the health behavior and knowledge outcomes achieved by the program’s participating students. In order to continue to build the case for creating a health literate organization, members of the Health Literacy Task Force and Safety Department at a Midwest children’s hospital, reviewed and identified health literacy-associated safety events. The aim was to determine the health literacy themes in safety events reported. Health literacy events were 4% of self-reported safety events with main themes related to: 1) medication errors, 2) verbal communication errors, and 3) discharge errors (instructions and process). The analysis also found that a lack of several ‘Attributes of a Health Literate Organization’ are contributors to safety events and that there is a financial impact for not addressing health literacy challenges in a health system. The speakers will share findings and offer solutions to help address health literacy challenges in healthcare settings. 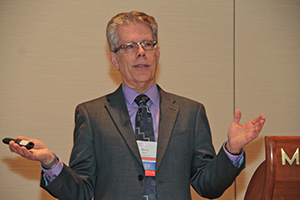 The Wisconsin Pharmacy Quality Collaboration (WPQC) members have received health literacy training to help identify eligible patients and facilitate meaningful interaction between pharmacists and patients during CMR (Comprehensive Medication Review) services. The process for identifying and qualifying a patient for a CMR service based on health literacy will be detailed, and numbers of CMR services occurring in 2017-18 based on health literacy will be reported. Linkages between health literacy as a barrier to adherence will be made, and adherence toolkit strategies will be reviewed. Several patient encounters will be described, and barriers and mitigating strategies to the current system will be outlined. With today’s focus on obtaining information online or going mobile, there is a digital divide for individuals with low health literacy (Pew, 2015). 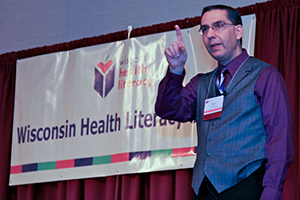 Through a Health Information Outreach Grant funded by the National Network of Libraries of Medicine (NNLM) Greater Midwest Region (GMR), Wisconsin Health Literacy (WHL) is collaborating with local libraries and literacy agencies to offer “digital health literacy” workshops for consumers most at risk for low health literacy. In this session, you will learn about WHL’s proven educational workshop model to reach vulnerable populations, the program content, and ways to help community members identify and effectively use trustworthy sources of online health information. You will also learn how to plan, apply, and write a successful proposal for funding from the National Network of Libraries of Medicine (NNLM). Tools and resources for writing proposals will be shared along with examples of previously funded health literacy practices. Do you have peripheral neuropathy? To a healthcare provider, this question may seem very appropriate when posed to a patient who has a history of diabetes. To a highly anxious, 76 year old male at his first visit to a neurosurgeon for back and hip pain, the question can be confusing and frightening. During this session, the consequences of poor health literacy will be discussed, followed by the exploration of the use of plain language in healthcare interactions. Participants will examine strategies for communicating health information using a universal precautions approach as outlined by the Agency for Healthcare Research and Quality (AHRQ). A small group exercise will provide the opportunity to apply improvement strategies to case studies based on real life patient experiences. Hmong people have lived in Manitowoc County for more than 40 years. Still, no Hmong elders used the senior center or senior meal sites, and thus Hmong people missed opportunities for blood pressure screenings, insurance counseling, and exercise classes offered there. Discussions with Hmong elders made it clear that they felt isolated and treasured opportunities to see one another, but language, transportation, and cultural barriers were the problems. Learn about a pilot program that is offering traditional Hmong food at a senior dining site and using that site to offer information about medical care, Medicare/Medicaid, dental care, community resources, and nutrition - information that can improve the ability of Hmong elders to live healthier lives. The speakers will share what they learned and how this might be applied to other immigrant communities. Using the Health and Human Services’ National Action Plan to Improve Health Literacy, this session will describe how the Centers for Disease Control and Prevention (CDC) applied it to set organizational goals that advance health literacy. The session will provide a brief overview of CDC’s foundation in health literacy, describe the quality improvement process used to develop tailored work plans, share successes and lessons learned from two years of work plan development and implementation, and describe how the quality improvement process helped the agency make advances towards becoming a health literate organization. The session will conclude by sharing how participants can use the Ten Attributes of a Health Literate Organization developed by the Agency for Healthcare Research and Quality to assess their own progress. In this session, you will hear tips and strategies for conducting consumer testing that is productive in gathering and engaging diverse and low-literacy audiences and encouraging them to share honest resource review. Specifically, the speakers will address: 1) How to identify your target audience and encourage other community agencies to assist in organizing a focus group; 2) Focus group questions that are effective and how to encourage forthright responses; 3) Offering incentives (even when you have few resources) and deciding when to use a focus group verses one-on-one consumer feedback; and 4) Interpreting the results and knowing when you need to redesign and consumer test again. The adult ESL system is an ideal, yet under-utilized, context for health literacy interventions for harnessing learners’ own interpretations which can then be translated into improved health messaging. This session describes the impact of a participatory research approach – what the speakers call the ‘learners as data interpreters’ model – on the way learners choose to access, adapt, question, and use information to alter their own health actions. They will share preliminary findings regarding the impact of learner-generated health messages that cut across literacy skill levels. The speakers will share what they call ‘re-storying’ processes, where their team works with a group of adult ESL learners to analyze and then reinterpret health data in conjunction with learners’ personal stories. The audience will be invited to discuss the need for new data sources and new tools to reach immigrant populations and improve health literacy and health outcomes in these communities. To be innovative with your benefits communication strategy is to be brave and bold, especially when you work in benefits for a government agency. Employees find health insurance complicated and confusing, and administration is a real challenge when your government agency covers different departments, offers different benefit plans, and covers many people. This speaker has met this benefits communication challenge and has the improved employee engagement metrics to show for it. Learn the steps she took to modernize benefits communications for the State of Wisconsin and the challenges overcome. You will also learn how the interactive benefits communication software, called ALEX, helped achieve unprecedented levels of employee engagement for the State, as well as the strategy for launching a new benefits website. As an immigrant gateway community, Anchorage includes some of the most culturally diverse zip-codes in the country, with over 99 different languages spoken in the Anchorage School district. In response, the Anchorage Health Literacy Collaborative developed a Peer Leader Navigator (PLN) program. Unique to the Peer Leader Navigators (PLNs) is their diverse background and valuable insight. They are all refugees and immigrants who have the first-hand lived experience of coming to a new country, not knowing the language and trying to navigate complicated health information and community resources. They stand in solidarity with the community because they live, work and worship in the communities they serve. They too have experienced economic instability, language barriers, low health literacy and social isolation. The PLNs are instrumental in identifying community needs. They are vital in helping to design and implement the health information that is provided through their outreach efforts. This session will provide an opportunity to learn from the PLNs experience and how organizations can partner in similar ways to address the social determinants of health affecting some of the most vulnerable in our communities.